A man with a pack of charcoal briquettes for cooking on an open fire with the name of Donald Trump. 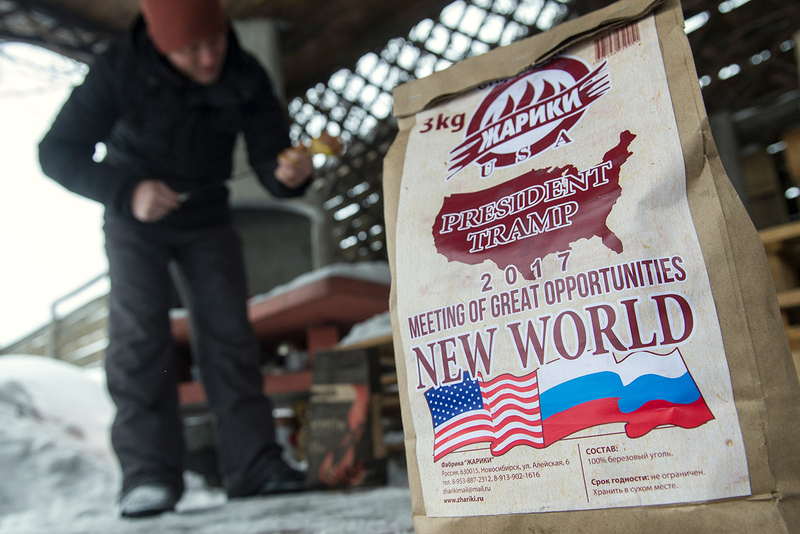 A Novosibirsk company that makes charcoal for barbecues has launched a new product called 'New World,' which is dedicated to U.S. President Donald Trump’s inauguration, and his future meeting with Russian leader Vladimir Putin. One side of the new charcoal package depicts a map of Russia and has the words "President Putin" written on it. The other side shows a map of the U.S. and says "President Trump." "2017 has begun, and there will be two political events that will have an effect on the future of the entire global community," said the company’s director, Dmitry Dyomin, in an interview with Rossiyskaya Gazeta. "The first is the election victory and inauguration of U.S. President Donald Trump. The second is the future meeting between Trump and Russian President Vladimir Putin. We decided to be a part of these events and to commemorate them with newly designed packaging of our products." A kilogram of "Trump" will cost about 65 rubles (just over $1). Also recently, in the city of Zlatoust in the Chelyabinsk Region, metal workers from a weapons foundry minted a two-pound silver coin showing a profile of Donald Trump, and dedicated to his Jan. 20 inauguration.